Type Choose whether the probe is for a Baked, Custom or Realtime setup? Box Projection Check this box to enable projection for reflection UV mappings. Box Size The size of the box in which the reflection will be applied to the GameObject. The value is not affected by the Transform of the GameObject. Also used by Box Projection. 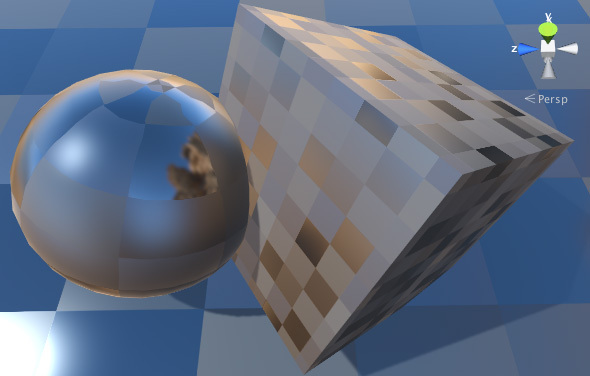 Box Offset The center of the box in which the reflections will be applied to the GameObject. The value is relative to the position of the GameObject. Also used by Box Projection. There are two buttons at the top of the Reflection Probe Inspector window that are used for editing the Size and Probe Origin properties directly within the Scene. 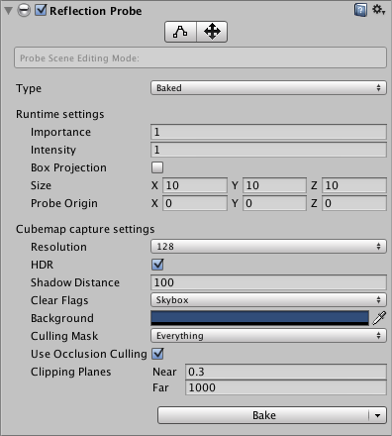 With the leftmost button (Size) selected, the probe’s zone of effect is shown in the scene as a yellow box shape with handles to adjust the box’s size.